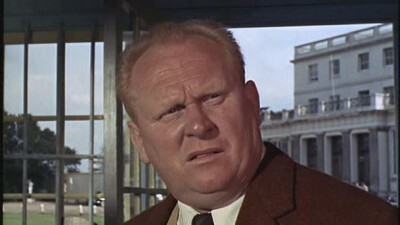 Say, Patrick, can you tell me the way NOT to get to Ireland? The Irish seem to have had all the “luck” lately. We only just reported on a turbine that tumbled back to earth in County Tyrone, Ulster a week or so back – with a sound like an “exploding bomb” (see our post here). And have been reporting about tumbling turbines and flying blades so often lately, we’re wondering whether the wind industry is suffering some kind of hex. Here’s the Irish Independent on – yet another – blade throw event. 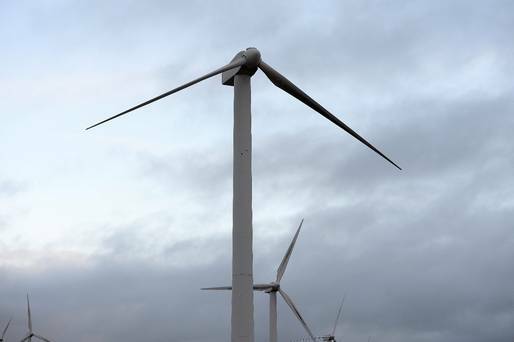 THE Health and Safety Authority is investigating how a blade became unattached from its turbine and fell to the ground at a Co Kerry wind farm. The blade, measuring up to 30 metres, came apart from its parent turbine, sparking fears locally about the safety of wind farms located close to houses. 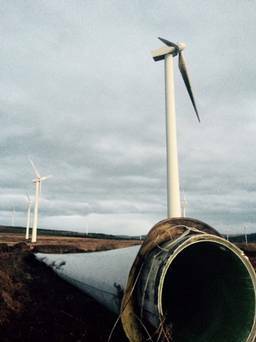 The blade appears to have been blown about 100 metres from the turbine at Tursillagh near Tralee at the weekend before hitting the ground. 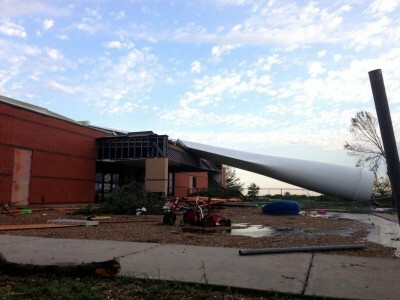 It is not known how the blade came away from the turbine, but damage to its tip suggests it hit the ground with force. Blade “safely” back on terra firma. Heavy machinery was used to access the area and remove the blade on Tuesday morning. A phone number for Tursillagh Windfarm Ltd was not being answered yesterday. Kerry County Council said because the wind farm at Tursillagh was a private development on private land, it was a matter for the developer. However, the incident has sparked concern locally, as there is mounting resistance to the development of wind farms on the Stacks Mountains. The Tursillagh wind turbines are among the oldest wind energy developments in Co Kerry and date back to 2000. Not far away in Finuge, residents have been involved in an ongoing protest over a proposal by Stacks Mountain Wind Farm Ltd to construct 10 windmills on bogland at Ballyhorgan in north Kerry. Residents are objecting to the height of the turbines, which are more than 150 metres high, the tallest constructed in the country. Kerry County Council’s Renewable Energy Strategy had earmarked the north of the county as being “open to consideration” for renewable energy, as wind speeds are considered adequate there. 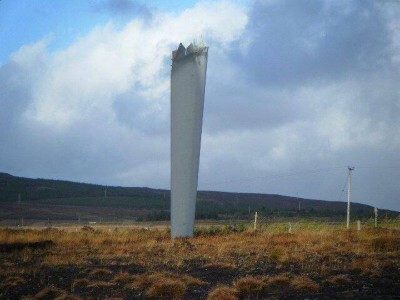 In a manner of lilting understatement – reserved to the Irish – Ms O’Sullivan describes the event as: “The blade … came apart from its parent turbine”. In wind industry speak it’s called “component liberation”. STT has been reporting on “component liberation” for some time now, including our post – Life in the “throw zone” which included video of a Vestas’ turbine “liberating” its components. We dealt with “Prowind” in our post – Logic: not found on other planets? – which included a serious scientific study into the distances blades are likely to travel during “component liberation”. The study dealt with over 37 “component liberation” events, recording blade throw distances of up to 1,600 m: that study was completed in 2007 – there have been many more bids for blade “freedom” since then. We covered a turbine liberating its components in a schoolyard at Caithness, Scotland in this post: Remember the days of the old school yard? And revisited the horrors brought to the Highlands by crashing fans and flying blades in this post: Gravity Bringing Wind Power to its Knees: Blades Keep Flying, as Farmers & Schoolkids Learn to Run & Duck for Cover. We also covered – yet another component liberation – in our spoof post – IWTs or WMDs? The obvious irony and sarcasm in that post was lost on greentards – a humourless bunch at the best of times – which prompted us to explain the difference between the literal and the figurative – in this post – It’s all about the costs, stupid. 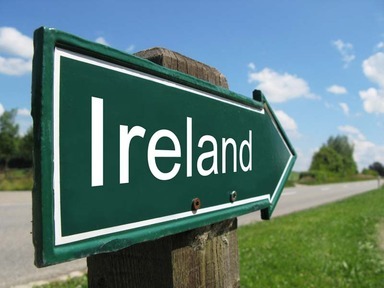 The Irish get ‘lucky’ again: this time in Donegal. The frequency with which turbines keep unshackling their blades and throwing them to the four-winds – and crashing back to earth – is fast appearing to suggest that none of this is ‘happenstance’, but is, rather concerted ‘enemy action’. And anyone within a bulls’ roar of these things should think twice about what might come flying in their direction, without any kind of warning. times and it’s obviously enemy action. In Australia, for “planning” purposes, the various states have a variety of “set-back” distances between wind turbines and residential homes – said (laughably) to avoid noise impacts: in South Australia it’s 1km, in Victoria it’s currently 2km – but before 2007, there was no set-back required and plenty of homes ended up with turbines within 600m. 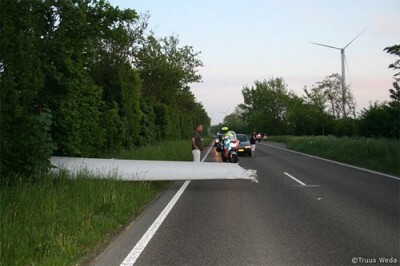 However, there is no such limit placed on the distance between roads and turbines. Eco-fascist nutjobs – like those that have just taken charge in Victoria – keep pushing to do away with set-back distances between giant fans and residential homes altogether; and couldn’t care about road-users, either. With whole (50m) blades travelling up to 200m, bigger heavier chunks likely to travel well over 300m and the smaller pieces flying out to distances of up to 1,600m (for a 10% blade fragment – think 5m long blade chunks) – the current setback rule in South Australia and what the eco-fascists want for Victoria places wind farm neighbours well and truly within the “throw zone”. 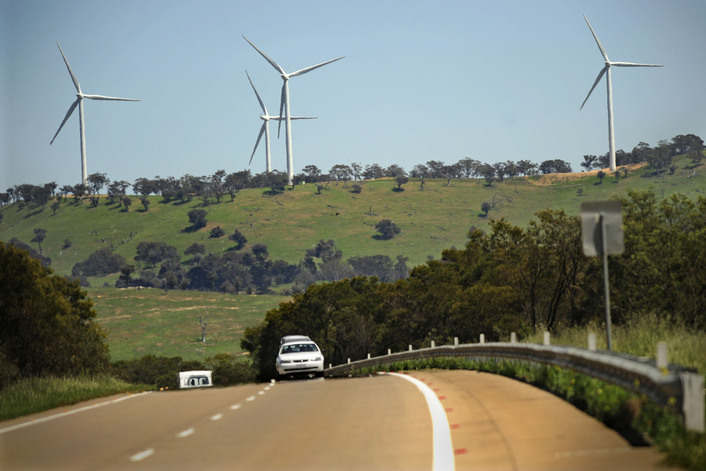 And with those numbers in mind, think about whole blades – or substantial chunks of them – being flung around with gay abandon the next time you drive past the turbines at Cullerin and Macarthur, some of which are less than 300m from the road you’re on. Motorists in the Cullerin “throw zone”. For those living in, or driving through, the wind turbine blade “throw zone” now is you chance to hammer the so-called ‘standards’ and planning ‘controls’ that have (or will) put you in it. Why not drop a submission to the Senate Inquiry along those lines? Note that the opportunity to make submissions to the Committee ends on 4 May 2015. See the link here. Once Governments stop subsidising wind pyramid schemes they will all be gone with the wind just like happened in California but not before it bankrupted the state !!! To put this would-be “minor challenge” into industry speak, the public should be aware the wind turbines on very rare occasions can suffer component liberation, this can sometimes be caused by defective rotor brakes. On even more rare occasions, defective rotor brakes can cause some damage due to component overheating. Or in plain Aussie speak, people should be aware that wind turbines sometimes have blades or parts of blades fly off. This is commonly caused by excessive rotor speed following brake failure. In such incidents blade parts can be thrown up to a kilometre from the turbine tower. Brake failure can also cause overheating and fire inside the turbine nacelle, commonly resulting in the total destruction of the turbine. Nacelle fires cannot be approached by fire fighters because of the large hazard zone around the turbine subject to falling and thrown flaming debris. I guess that is why the wind goons will never put an IWT in a capital city, but are happy to sacrifice rural folk and passers by to the risks of catastrophic failure of their cash cows. Shame on this industry and their sycophantic greentards. The sooner they are held accountable for their abuse of public health and safety the better. Thanks again STT. Who is going to be responsible and accountable when turbine debris, flying through the air, injures or kills someone? It will happen, we know it is going to happen one day or night. It’s just a matter of time. Another question. Will it be Governments, wind weasel outfits or wind weasel hosts that will be held accountable? I hope the lot.